24 April 2011: Either by design or imbecility the re-planning of the Indian city of Gandhinagar by the consultants to its urban development authority has obliterated its identity as a state capital. The city’s consciously created axial layout and egalitarian Gandhian ethos has been dismantled. The juggernaut of unbridled capitalism has led to its debasement and inorganic extension resulting in its becoming just another suburb of Ahmedabad. The city was first designed and implemented between 1965 and 1970 by two Indian town planners, H. K. Mewada and P. M. Apte. At the time an influential group of architects from Ahmedabad, with the active support of certain industrialists, had tried to usurp the job by bringing in American architect Louis Kahn who was in Ahmedabad to design the buildings of the management institute. The state government, however, was determined to have the city designed by Indian town planners in the best traditions of Gujarat’s rich heritage of town planning and principles of Mahatma Gandhi, who had his Ashram just south of the new site on the banks of the river Sabarmati. The government therefore persisted with its choice of the two men to plan the new capital. Unlike Chandigarh, designed on barren lands with no sizeable existing human settlement nearby, the site of Gandhinagar is just 23km north of the flourishing city of Ahmedabad. In order to establish and maintain a separate identity for the new city, a surrounding area consisting of about 39 villages was brought under a Periphery Control Act (as in Chandigarh) that permitted new development of farm houses only. 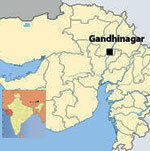 The area later constituted a separate administrative district of Gandhinagar. The city is planned on the western bank of the river. Owing to constant military confrontation with Pakistan, whose borders are close to the city, a large military presence was required. The land acquired on the eastern bank, adjacent to national highway no.8, was therefore allotted to the border security force and a military cantonment. Considering the mostly south-west to north-east wind direction, the land to the north of the city was allotted for the then biggest thermal power station and the adjacent areas were zoned for industrial use. This area was distanced from the township by a 2,000ft wide green strip of thick vegetation. Being planned as the administrative capital of the state, current and future population employed in state government offices was distributed in 30 residential sectors around the State Assembly-Secretariat complex. In each residential sector some 50 per cent of the working population would be government-employed. Plots on the periphery of each sector were designated for private and supporting population and made up the other 50 per cent. The city was planned for a population of 150,000 but can accommodate double that figure with increases in the floor space ratio from one to two in the areas reserved for private development in all residential sectors. The river being the border on the east, and the industrial area to the north, the most logical future physical expansion of the city was envisaged towards the north-west. To retain the identity of the city as a new town and capital, the planners had provided for its growth away from the city of Ahmedabad, which is to the south. Hence as a rational extension of the grid to the north-west the original planners had envisaged 30 additional residential sectors that could accommodate a population of 450,000. Thus the growth potential of the city by density and area in its proposed expansion to the north-west was for a population of 750,000. But the consultants appointed by GUDA wanted expansion towards the south so that the land between the two cities would have an inflated market value that could be exploited by private developers, and in the process everyone would get a share of the pie! 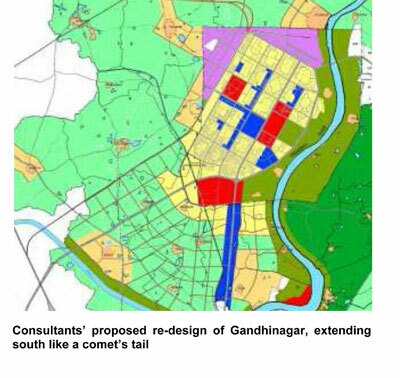 The consultants to Gandhinagar Urban Development Authority (GUDA) neither reviewed the original city plan in the context of the concept of a new capital with the regional economic/industrial development or growth matrix of a new town, nor did they consult the planners of the original master plan, thus eliminating the opportunity of informed and constructive debate. The consultants’ proposals, driven by the profit motive, prompt serious doubts about their honesty, integrity, and professional competence. Would they have dared to make such proposals if Gandhinagar had been designed by Louis Kahn or Corbusier? Their proposed southward expansion will simply merge it with Ahmedabad and it will finally become its suburb  thus destroying its separate identity. If the city is to be expanded and extended, it can be done as originally envisaged. This would be rational and in keeping with the original concept. The urban design and the central vista would be retained and able to absorb new design ideas without destroying the basic concept. Extension to the south has completely destroyed the most important and monumental concept of the central vista (Road no.4) that focuses on the capitol complex and was naturally to be extended to the north-west, maintaining the axis and expanding the city physically in that direction. The location of Gandhi’s memorial on this axis, as part of the original plans, has been removed! The consultants while extending the city to the south have designated a considerable belt of land on both sides of the Koba-Gandhinagar expressway (an area of 2.50sq. km.) for commercial use while more than 50 per cent of the designated commercial area in the city still remains unsold! Over 6,000 acres of green cover to the south-west of the city has been designated for residential use in an attempt to join it with the city of Ahmedabad. All this land, when developed, can accommodate a population of over 600,000. With the connivance of the consultants, vested interests bought up this land in advance of the proposals. It will be revealing to know who bought it! 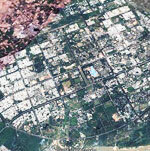 The consultants have thus sought to destroy the identity of the new capital city and make it a suburb of Ahmedabad. The Gamthan areas (built-up land in a village) of seven villages just abutting the city limits of Gandhinagar have been increased arbitrarily (much beyond their natural growth requirements) to allow private residential development. Who bought this land? These enhanced Gamthan areas together may accommodate a population of over 150,000, thus totalling 750,000. 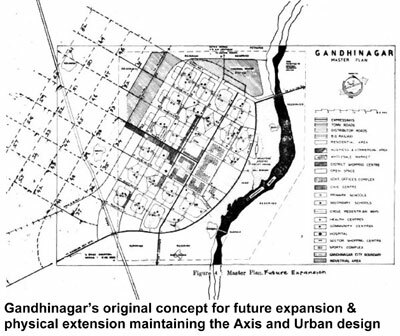 Ironically, the original plan of Gandhinagar did provide for similar expansion of population and the city area, yet retaining its identity, original concept and urban design. The consultants have thus dealt a death blow to the organic growth of Gandhinagar and have helped private developers to get cheap land for developing commercial and residential apartments with access to free physical infrastructure (roads, water supply, health, education and cultural facilities provided in Gandhinagar by the state government). Not content with this abuse of the basic concept, the consultants have dismantled some important urban design features of the plan. A major area for cultural facilities in the city square in sector 17  the city centre - is proposed to be converted to commercial use, killing Gujarat’s traditional concept of a 'city square' and destroying a major element of 'urban design' of the new capital city. An area along J road (by the river) across sector 9 covered by ravines, was originally proposed for conservation as an adventure park. It is now designated by the consultants as residential, taking away a unique recreational facility. The open spaces at the junctions of all main roads of the city, left open in the original plan to improve future road geometrics, ornamental landscaping, road signage, guide maps, and so on, are proposed to be filled in with roadside petty shops and hutments for immigrants, giving the city a slum- like look.